If you are living round the London area and you like extreme Metal music, then you have definitely seen Abgott before. Lately, they have been opening the gigs for bands like Enslaved and Behemoth, and while doing that, they have gained quite a few fans. Now that their latest album "Fizala" has finally been released in Europe, I took the opportunity to make an interview with the band's frontman Agamoth. Beware of the beast! Hi there Agamoth. I had the impression that Abgott is a new band, yet I found out, after visiting your website (www.abgott.co.uk), that you have been around since 1997. Tell us a few things about the first period of the band and the reasons that made you decide to form Abgott. Agamoth: Hail John, yes it is quite sometime that my creature is around. Well, Abgott started as a side project of mine, as I was full involved in play guitar in a techno death metal band, which had produced two good demos and at that time, we were really busy playing live. Unfortunately, the band did not get far due to usual �technical & ideological� problems and I decided to keep going with my own project, as it was far more reliable. In 1990, I started my own underground label and I was into demo and cd trading and black metal was the only reason to keep going, I even had a chance to trade with DSP. Anyway, at that time, when I did put the band together I already had a few songs ready, plus a few covers I loved to play such as Transylvanian Hunger, Deathcrush, Funeral Fog, Mourning Palace, I am thy black wizard and so on� so we easily recorded the Celtic Metal Battle demo tape and with surprise it went down very well in the underground. It was good evil drinking fun in doing it with the classical necro sound and all the �do by yourself� situations, we played few gigs and I kept composing songs, so in 1999/2000 I recorded the homonymous debut full length, which has been really well accepted not only by the Italian underground scene, but around Europe. Unluckily I did not find a good deal, so I just produced it myself in a limited quantity of 1000 copies and distributed it. For the time being it is still sold out and has not been reissued, yet. 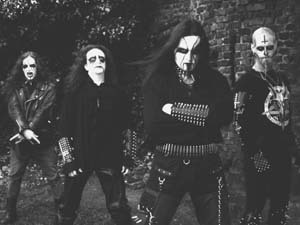 As you can understand it was not easy to be a �South European� black metal band and try to make it in an extreme metal world mainly based on the �North European� scene. In the beginning I had to face a lot of distrust from the metal people around, due to the fact that the band was based in Italy, because of the drastic change from death to black, but I am a die hard mind and I did not care and most importantly, I did not surrender. Even though Italy has a very active Metal scene, there are only a few extreme Metal bands like Mortuary Drape and Bulldozer that managed to make a name outside their own borders. How difficult was it for a band like Abgott to get enough support in order to present their music to bigger Metal audiences? Agamoth: Well, I can say that probably Bulldozer did not know, as probably they still do not know it today, how good considered they were abroad as they never really been so much considered in their own homeland. I love them; they were a kind of guideline in my beginning. Much better has been Mortuary Drape, they never stopped; they just produced a new album, and it is simply fabulous an example of how good an Italian band can be if it can receive a chance. M. Drape has its own sound and originality, nothing like other bands, it is not one of those clone bands and they have been another of my inspirations along with another two great bands Death SS and Evol. For my own band the only reason why I had the chance to become active on the �bigger� scene is due to the fact that I just concentrated on my music leaving out everything else, I spread the word about the band as much as I could, being in contact with as many people as possible, believing in my music and my ideals and mostly being an honest metalhead (110%!). I understand that one of the most important moments for the band was when you decided to move to the United Kingdom back in 2002. I can understand why you made such a decision, but what I was wondering is why was England the country of choice for you? In retrospect, do you think that this was a successful move on your part? Agamoth: Well, I grew up with heavy metal, my diet was based on Black Sabbath, Judas Priest and Iron Maiden, this is one of the main reasons why the UK has always been my �idyllic� place to live. Of course, I came here also to study music professionally and finally take a different step in the world of the music business. In this country there is a lot of respect for music and musicians and a lot more opportunities as it is recognised as profession, while in Italy it is seen as a bit of a joke and if you want to get live gigs or be heard, a young band must be part of this �family� or that �family� or clique. In Italy the �Christian corruption/Mafia� found its place even into metal�shame on them, this is disgusting and against the principles of metal itself. Here (in the UK) the audience is far better and receptive and there is nothing better for a musician then being understood. Really important is the fact that the vision of music here is different, it is real and it is part of the country heritage and anybody gets a chance to experience it. To have different music visions in my brain makes my own music vision wide open and more related to different points of view and it definitely gives more input and character to the music itself. So, once in London I enrolled at the Guitar Institute of Technology and made my way through it. Also, it has been an excellent chance to meet new young musicians and finally put together the actual line up, the best Abgott ever had. The band has experienced quite a few changes in its line up. Is it very difficult for you to find the right people to work with? Tell us a few things about the current line up and whether you are finally satisfied with the musicians that take part in it. Agamoth: The line up� mmmhh, such a pain in the arse to find the right ones. I give lots of space to every new member to express himself through out Abgott music, but it is difficult to find people keen to do it, if they are committed, then they might not be talented musicians and if they�ve got all these good pre-requisites then they might not be good live performers, so it is not based on my needs, but on the capabilities of who joins the band. I am terribly satisfied with the actual line up. First of all they are all professional musicians, metalheads, good friends, talented and 110% committed to my creature, it is the perfect evil chemistry. Another important moment for the band was when you signed the contract with Oracle/DMG, a label that is associated with Juan Garcia (Agent Steele). Do they still handle the band's affairs? What about Conquer records - how did you end up working with them? Agamoth: The way I got involved with that deal is simply unusual, I met this girl Julia Brown from USA, I gave her a copy of the album as she liked �unconventional� black metal, she just sent it to her boyfriend Robert Cardenas (Coffin Texts, Engraved), who is graphic designer for the label and he passed the album to Juan Garcia who liked it and signed Abgott, even before I knew it, I just received at home, from California a five years contract with a nice cheque. Yes, Oracle still handle all the band�s affair as the album sold 20000 copies, but by contract they only work on USA and Canada and it is at this point that Conquer Records get into the game, they took the full license for West/East Europe. I knew Tomasz (of Conquer Records) for quite sometime as we had few friends in common. Then, he is a real passionate and talented metal music scout, but mostly I knew that he has always taken lots of care of his bands and when he proposed me the deal I was sure that he would treat my creature with surgical precision, making it evolve and giving it far more chances to hit the road as he is a really good live organizer/promoter. From Tomasz� side, he knows that Abgott is not a �fu*king rock star band�, but an unstoppable fighting machine, hungry for live shows and keen to spread blasphemy and evil all over with passion and without great pretensions. OK Agamoth, let's concentrate on the band's latest studio album "Fizala". What does the name of the album mean? Does it have anything to do with H.P.Lovecraft by any chance? Agamoth: Fizala is Alazif backward and from the Arabian language it means �noise made by nocturnal creepy creatures�. Originally there were seven books written by Abdul Alazraq, which means �servant of the darkness� and only after three hundred years it was translated in a single volume, in Greek by Teofilato also knew as Pissarios and he changed the title into Necronomicon, to avoid the censorship which was trying to destroy the few original parts of these seven books still available. As you can understand from this preface, Fizala as a concept has nothing to do with Lovecraft even though I read all his books, but it is closer to the A. Crowley ritualistic vision. As you might know there is a link between Lovecraft and Crowley as they were epistolary friends and as the writer�s father was a Crowley worshipper. So, the points in common are strong and it is to recognise Lovecraft as inspired by Crowley instead of the mastermind himself. In my personal researches I have been able to find a copy translated of the Alazif in the Vatican vast library, when I was in Italy, as it is not a banned book and it is not a title of the prohibited list of books that the Vatican posses. In comparison I realised that all the rituals reborn by Crowley were terrifically identical to the ones in the Ancient text. After studying the different versions and all the connections between the texts and the rituals I came to the conclusion that the only missing link was the sound, so I worked to create the right vibrating noise that would have helped the ritual be fulfilled. I have to admit that when I first got my hands on the promo of the new album, I thought that I would listen to typical extreme Black Metal - as you understand, I was totally taken by surprise when I realised that this was not the case. How would you describe the band's musical style and direction? Do you think that the term Futuristic Progressive Black Metal would give justice to your music? Agamoth: Abgott plays Black Metal and the only adjective I can add to it is �unconventional�, just to highlight the fact that the listener are not going to hear the �typical extreme Black Metal� album. Fizala is a gamble; this is also what I love from this album. It is pure black metal experimentation. Listen to De Mysteriis Dom Sathanas and tell me what do you hear? I tell you what I hear: a difference, a new sound, experimentation, an alternative to something else. Does it teach to copy it? Does it sound like a clone? No and here is based the philosophy of Abgott and Fizala is not the typical, usual, cloned album. I have my own vision of it, my own interpretation. I am not here to propose a rip off clone band. You either like it or hate it, it is up to the listener. For sure I am not intending to go back on my steps so the future of Abgott is based on evolving to a new dimension and new boundaries of black extremism. Personally, I do not define my way of playing, it is just unconventional black metal and for the moment I leave the pleasure of labelling it to the listener. I always believe that you need to be a very skilled musician in order to play any form of technical extreme Metal music. Do you believe that the members of Abgott have the right musical knowledge that's required in order to create such demanding compositions? Agamoth: I totally agree with you: no skills - no metal. The actual line up is the best I could have ever found even though they haven�t participated in the creative part of this album. All of them have experiences and studied music madly and I am not talking only of metal, but professional music in all its aspects. Antichrist is evil, a psychopath that wishes to murder, but apart from this he is pure groove and techniques, he has over 24 years of music experience and he spent a quarter of it studying jazz, he was in to lots of metal projects, he has his own �signature� way of playing metal and he literally blew my brain out when I auditioned him. Daemoon, he is the youngest and the �black metal made flesh�, a strong personality, he is blasphemous and twisted, he is the brother in arms of a thousand evil adventures; as a musician I can say that he is blacker by recognising the greatness of old school rock and metal before the price of almighty black metal; he is an exceptional sight reader with an enormous versatility. The last, but not least - Thanatos, his greatest credential was the fact that he professionally teaches guitar technique and he was awarded top guitar player 2000/2001 at the G.I.T. In fact, he is the proper original hyper skilled guitar maniac, a talented and virtuoso that dedicated his own life to metal music as the only reason to live, a defender of the classical metal icons. Originally, he was supposed to be just a session player in Abgott, for a few gigs, till I found a stable member, but the power of black metal got its infinite ways and he also got trapped in it. Even though there are eleven "different" tracks on "Fizala", you can feel the existence of a unique atmosphere throughout this thirty-minute album. Is "Fizala" in any way a concept album and if yes, what is the main theme behind it? Agamoth: Yes, Fizala is a concept album, my black grimoire, my music interpretation and translation of the Alazif. My goal was to trap in music its rituals, the way to reach a successful manifestation of the divinity, the state of mind to a new dimension. It is lyrically and sound wise an album that will have a strong effect only on the sensitive listener, an album with a concept that will be understood only by those who really are part of the elite. All human beings have an origin, but not all of them come from the same source. It just sleeps inside waiting to be woken up. Of course it is not an easy task and it can be easily mistaken for a huge joke to laugh at and my answer to this is: who laughs at it are those who are slaves of the finite humanity and predefined boundaries, those are the eternal slaves, the perfect puppets in the hands of other human puppeteer master. Which is the source from which you draw your inspiration as an artist? Are you one of those people that are particularly fascinated by the occult? Agamoth: I am not a little kid fascinated by something mysterious and slightly dangerous�, I do not play with it neither do I make a joke of it and that�s because it is twelve years that I am a Satanist, an accurate occultist, I study it, I practice it, I worship it, I respect it, I live it and here is the basic to understand my inspiration and interpretation of black metal and in a more large range extreme music itself. Darkness, evil perversion, obscurity, the different point of view, pleasure of the flesh and blood, mind and spirit provocation, do what thou wilt, what a wide range of inspiration they can be, don�t you think? Back to your new album. The recordings of "Fizala" were finished near the end of 2002, which was more than two years ago. Are you still satisfied with that specific release, or are there any things that you wish that you had done better? Agamoth: I am always satisfied with what I record; it represents my state at that time. Clearly enough many things are changed since then and probably, if I should re-record Fizala now, it would surely sound different. The choice made during the composition of a song is not the same from time to time, you know that. In fact, you might have realised that live the songs are slightly different, the songs are played faster, with more groove, the repetition of some particular riffs are increased to give time to the listener to better go with it. I also asked Thanatos to add some solos to give more fluidity even though with specific and right mood to keep intact the atmosphere of the song as it is on the album, so I am trying to prepare the listener to what might happen in the next album. I understand that the members of Abgott give plenty of emphasis to both lyrics and general attitude - you can easily detect it by visiting the band's website. Which is the main source of inspiration as far as the lyrics are concerned? Do you believe that Black Metal bands should invest in "provocative" lyrical context? Agamoth: The main source is based on my knowledge of evilness, in fact I am the only writer; whenever I present the texts to the rest of the band they always come up with positive feedback and all the time they appreciate the result, as I write about matters that are a shared interest with them anyway. The dark spark comes from the inner obscure desire to evolve/elevate to a superior state of mind and spirit, totally different from the human state. I am communicating a different dark message into the listeners mind, yes the iconography is similar to the typical one that anybody can find in any black metal lyric, but the direction that it leads is totally different and I prefer the listener to have the pleasure to discover more particulars regarding it. What is your opinion about religion and the effect that it has on people? Which are the positive and negative things that you can detect? Agamoth: First of all, as far as it concerns religions there are not positive things that can be found in them. Religions are pure manipulation of the human mind. Religions have been invented to control humanity and lead it to the total destruction of freedom and self-confidence under the fear of a god that will punish you. Oriental religions lead people to kill and to die, occidental religions pervert people for the pleasure of the flesh and for the power of material possession. Living in Italy anyone can see how corrupted Christianity is and as the English philosopher Wycliffe once said: �The closer you are to Rome the more you are corrupted�. I have to congratulate you on the band's very impressive website. Who is responsible for keeping it up to date and how important is its contribution in promoting the band's music? Agamoth: Hey thanks, well the web has being designed by Thor (check out www.thor23.com) he is graduating in web design; he is a blacker 110% Abgott supporter. The creation of the new design happened under my strict supervision and ideas, and it perfectly substitutes the original one designed by Arc V 666. Unfortunately for me and the site, but good for him, as soon as Impaled Nazarene improved their status, Arc V 666 had no more spare time to keep being a webmaster, so Thor took it over and presented me with the new one, which has still some remembrances of the previous one (check the nun). As far as it concerns the updates it depends on me as soon as I communicate to him the updates, in a few hours those are on. Clearly nowadays everybody at least once a week goes on the internet and it is the new word by mouth, it gives lots of possibilities and distances are totally eliminated. Abgott.co.uk gets monthly 5000 different ip numbers contacts, daily we got at least 100 different downloading of the mp3s. The gallery pages present 250 different ip numbers contacts a day. With the net you are there whenever anybody needs it and for this reason as much as it is always kept updated, the user will always know what is going on with the band�s activities. I have seen your band perform live quite a few times this past year, last time being when you opened for Behemoth at the Underworld. How did you find the whole experience? Are the English crowds friendly towards Abgott's music? Agamoth: Well, the few days we spent on the road with Behemoth in Bradford, Birmingham and London have been so damned good. There is always a chance to learn from older and experienced bands. We had the chance to gain contact with Metal Blade to have a chance to get involved in future festivals. The last gig in the Underworld has been the best of them all as people were amazing under the stage, I was literally impressed. It was a perfect alchemy and we shared the perfect chemistry with the crowds. English crowds aren�t that easy to convinced, but if they realize that the band has something to say and it is not the usual banality, then they really enjoy the event as the band does, too. We were supposed to stay on the stage only for thirty minutes by straight timetable, so as soon as we reached the last song I was about to call it a day, but the tour manager came along telling me to keep going and so he did two times, with the result that I announced three encores - what a satisfaction! After the show, he just explained to me that the people were so excited by our performance that he did not want to disappoint the crowed. What can I say more, if not, so far, the English crowd has been the best. The majority of the Black Metal bands that I know are totally against the idea of performing in front of an audience - best example being Darkthrone. What is your attitude towards live performances in general? Any more live dates planned for the near future? Agamoth: Abgott is a live act and I personally do not care what other black metal bands decide to do regarding live shows. For me it is total nonsense to compose music and to stay then hidden from the stage. Probably, some of these bands are not able to perform on the stage? Live performances are the heart of a music style, black metal would end into nothing and turn to an inevitable end if nobody performed it alive. In the near future Abgott is going to perform supporting Enslaved here in London, then go to Italy where we will headline a festival, to move after to France for two gigs, Belgium for three gigs, UK for more performances and Poland for an open air festival. We just hope to cover the whole of Europe by the end of the year with gigs in Germany and the Netherlands. We are just waiting for confirmations of them. Which were the bands or artists that have influenced you the most as a musician and how much was the sound of the band influenced by their general contribution to music? Agamoth: As black metal goes I was influenced a lot by Darkthrone, Mayhem and Immortal in the starting period of Abgott and you can feel it listening to Abgott�s debut full-length album, but once I paid my tribute to the old school, I suddenly felt that it was not exactly the direction I wanted for my band. I want Abgott not to be the clone band of a Norwegian act or even worst the ridiculous �re-issue of the same song� over and over again. So, the influence of those bands ended after one album to leave space total, radical, extreme freedom in interpretation of black metal in my own singular way. What is your current relationship with the underground Black Metal scene? Would you say that Abgott are actively involved in it? Agamoth: Abgott is black metal and has been a part of the underground scene for years. My band is totally active and involved into it. I personally support the underground and the new bands that are fighting to be recognised, here in UK there could be a huge black metal scene, if only there would be more attention to those bands that really kicks arses and just to name few: Ethereal, Sermon of Hypocrisy, Commandment, Cruel Humanity. I have seen them live, when they shared the stage with us supporting Abgott and I�ve been impressed as these young people are able to be so blasphemous and modern, totally far from being clones of the Norwegian heritage, but unfortunately they remain in the darkness cause nobody tends to care about own new comer bands. Well, I just support and respect them. This is underground. Have you listened to any good music lately? Name some bands that you think that people should invest in, and the reasons that they are to your liking. Agamoth: To be sincere with you, I am not listening to anything these days as I am composing songs for the third coming album. I do not want to be influenced by anybody and the best to be sure that that won�t happened is to listen to nothing else than your own ideas. So I can suggest to those who haven�t done yet to invest in Abgott. Are we to expect a new Abgott album in the near future? How different is it going to be compared to "Fizala", and how have you pictured the band's future in general? Agamoth: Yes, definitely, we are going to record the new album in October, slightly late due to the fact that the Studios were booked till that time. The original idea was to go in studio in June. Well, Fizala is a finished chapter, I intend to maintain the progression alive and to reinforce this point in the band, but at the same time to give more space to the dark side of the band, composing the songs in a way that the listener will not have such a hard time understanding the album. It will be fast, technical, different from its predecessors and with more intensity. In the near future Abgott will face a lot of live activities and a stressful time in the rehearsal studio as I want the band to be extremely ready before getting in the recording studios. We have a long road to walk and a never-ending fight to conquer what we deserve, so Abgott�s got an obscurely bright future. Agamoth, thank you for doing this interview - I hope to see you again soon on the stage of another London venue. The last words are yours.